The words [Hijab Streamliner] were first coined here at alsharifa.com to describe the "plastic thing" to get the peak for Turkish style silk hijab, Amira, and other hijab styles; to raise the front of the scarf up and give a sleek elegant look - to get the look you see in the photo, below. Quantity Two (2) per package. It may be relatively expensive / infeasible to ship this item alone as mail carriers charge a premium for the first few ounces of weight. This item is ideal as an add-on item to other goods you are buying at this website. Learn how to get the hijab bonnet look using the hijab Streamliner also known as the plastic thingy, or plastic thingie, etc. Alsharifa.com was the first to coin the words Hijab Streamliner to describe this item. A quick 3-minute tutorial using three different types of hijabs / scarves. Good length and width.Easy to trim for the more narrow bands on hijab caps and perfect width for most of them. Works great with square scarves for wearing either as hijab or tichel. 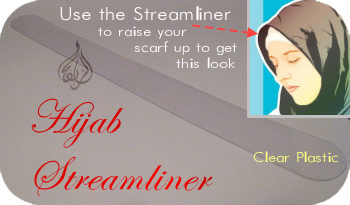 I love the Hijab stream liner! It gives me the perfect lift that I need for my face shape. Thanks so much for a Great product! I don't know how I ever lived without it! These are simple pieces of plastic that give your hijab brim a nice shape. Easy to use. They arrived quickly and are the quality expected. i was fascinated with how ladies got their hijabs a certain way, and found out they used this plastic thing. I love it! it's pretty long and rounded. I received 4 in the quantity of 2 which is nice. ordering went pretty smoothly, i didn't wait too long for this to ship. Would buy from here again. I Finally Mastered the Turkish Hijab! I had been at a loss as to how to get that perfect visor in a square silk scarf that is so popular among Turkish sisters and had even tried my own homemade devices out of cardboard. None of them lasted or looked just right, but finally, this silly little piece of plastic, does EXACTLY what I wanted with the durability I needed. Thank you sooo much! This is just perfect, I've looked for this everywhere, but didn't find any! Definitely will recommend to others, and will definitely buy more. Thanks again. I have never used these and they are sitting on my bueaty table lol but I am excited to wear them and will be experimenting and practicing. Very excited to use these. I always have a problem with making my hijabs stay, this gives it that look i always tried. Really good. It frames the face so well. The videos are nice. Click the button below to add the A Pair of Hijab Streamliners [Clear Plastic] to your wish list.